1. Create a new LANSA process named iiiPRO04 XML Tutorial, where iii is your unique 3 characters. (If the process already exists, select a different set of characters for iii.). 2. Create a new function named iiiFN04 Department Server, belonging to process iiiPRO04 (where iii is your unique 3 characters). Create the function without using a template and make sure that Enabled for RDMLX is checked. 3. Switch to your project in Integrator Studio. 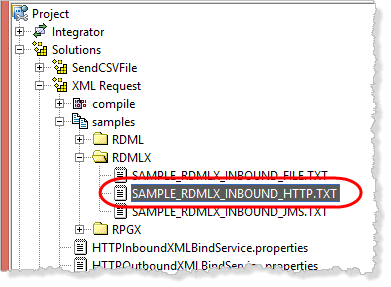 In the XML Request solution expand the samples/RDMLX folder and open SAMPLES_RDMLX_INBOUND_HTTP.TXT in the Studio text editor. Simply double clicking on it will open the text editor. 4. Copy and paste all the code into your function iiiFN04. Replace existing code. Note: The fields shown as comments at the top of this code should already exist in the Repository, if not, create them. 5. Locate the GROUP_BY command towards the top of the code and change its name to DEPTREQ. This GROUP_BY is simply reference so that a value can be mapped into field DEPTMENT. 6. At this stage, the server function now has code to retrieve information from the XML document. Save your changes.